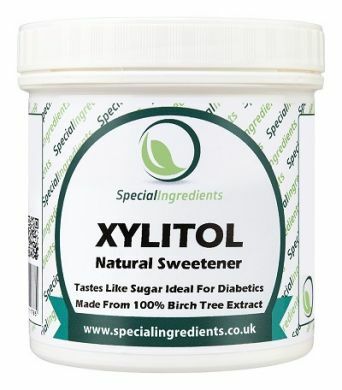 Xylitol medium pot 250g is a premium quality refined powder produced from Birch Tree Extract. Xylitol is a sugar alcohol used as a sweetener and is a totally natural product with 40% less calories than sugar. Used as an alternative to sugar, Xylitol can be added cakes, candies, beverages and any recipe that requires sugar. It can also be used to make sugar free jams, marmalades and preserves. It won’t cause a sudden spike in blood glucose and has a glycemic index of 7, so is excellent for diabetics of any type. Use to sweeten any recipe as sugar replacement. 40% less calories than sugar. Add to beverages hot and cold. Use to reduce calorific value. Use as sugar replacement to lower Glycemic Index. Use as a sugar replacement.